I'm Aya Yamashige. handmade jewelry designer. My flower jewelry is made of shrink film. Sometimes I teach someone how to make a handmade jewelry. My workshops have been held in Tokyo since 2016.
and now,I am preparing to sell homemade kit of SAKURA jewelry. 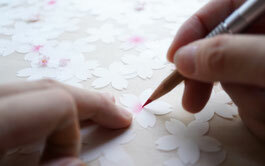 I have plans to post videos of how to make SAKURA jewelry on my Youtube channel. Sakura Hirari earrings…２０１８ ANNIKA Accessories design.